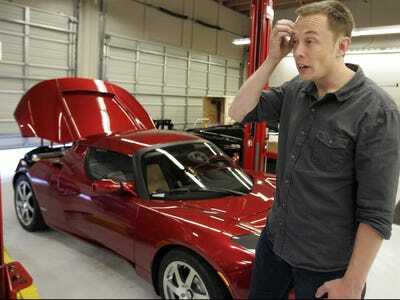 Tesla reported third quarter earnings on Wednesday and afterwards, CEO Elon Musk held a call with Wall Street analysts. Morgan Stanley’s Adam Jonas — who has taken a pretty out-there perspective on transportation — prompted Musk to give his thoughts on autonomous, or “self-driving” cars. Jonas was making a reference to a Google prototype of an advanced self-driving car, one that rolled out earlier this year. It lacked conventional car controls. 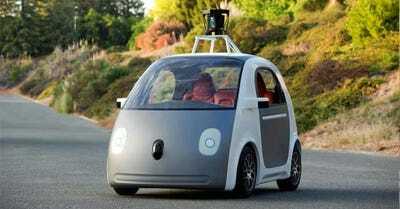 But in order to test the vehicle, however, Google will have to include some conventional systems, as stipulated by the state of California. Google has begun manufacturing a small number of the cars. So in manner of speaking, Google has joined Tesla as the second carmaker in Silicon Valley. I think there will be some amount of car sharing for sure, but I think there’s like a limit to the whole sharing thing. There is an important role for sharing but it’s not — most things don’t get shared. People could easily share their house or their clothes or their bicycle or something like that and they do a little bit with like Airbnb or something like that, but mostly not. One one hand, it’s unsurprising that Musk, whose business currently relies on selling people $US100,000 individual luxury cars, wouldn’t be all that big on the “sharing” economy. Buy a Tesla, keep it to yourself. On the other, he’s a smart guy who’s been right about non-bank payment schemes (PayPal), high-end electric cars (Tesla), private space exploration (SpaceX), and even easy-to-access consumer solar technology (SolarCity, a company that he’s chairman of). So his take on sharing, however pessimistic, needs to be taken seriously.